Centre for Sight are constantly looking to find new ways to tackle dry-eye, and one of only a few centres is Europe to have the Lipi-Flow system to treat Meibomian gland disease. While not suitable for all we have many options that can help relieve the sufferer. Dry eye does not frequently cause blindness, but as it is such an uncomfortable condition, it is a common reason for seeking assistance. Furthermore, dry eye syndrome can in additiona to discomfort, can impair vision with a decreased ability to perform activities that require visual attention, such as reading and driving a car. Book a Consultation to have your Dry Eye evaluated at Centre for Sight. Centre for Sight offers a fully comprehensive dry eye consultation inclusive of dry testing. Your consultant will perform a thorough eye examination and provide an explanation for the reasons why the eye is dry as well offer a course of treatment. Please note dry eye is often a chronic condition and can take a while before there is any percieved improvement. Severe dry eye is sometimes caused by Sjögren’s syndrome, which is an uncommon chronic, multi-organ, autoimmune disorder that also results in dry mouth and often arthritis. More information about this disease is available at: www.sjogrens.org. You should be seen regularly by your doctor and ophthalmologist if you have Sjogren’s syndrome. Several tests for Dry Eye are used by your doctor. The meniscus of tears, lid wiper action and distribution along with objective tests below provide information. Not all tests are always performed and are done where appropriate depending on a) Symptoms and b) clinical findings. Tear Break Up Time (TBUT) -The speed at which tears break up reflects evaporation. Schirmer’s Test– A test to measure tear production where strips of sterile blotting paper are placed at the outer corner of the eye for 5 mins. The length of wetting reflects the level of tear production. This test measures how concentrated the tears are from a micro-sample from each eye. The sample is placed into the TearLab diagnostic device and within a short time provides a numerical figure. This can be used to assess the severity of dry eye. The higher the figure the higher the osmolarity and indicative of dry eye. A reduction in osmolarity is an excellent method of assessing progress and the benefits of treatment. This test in now available at all Centre for Sight locations. 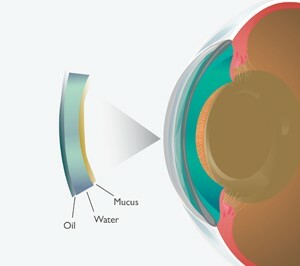 Lipiview: This is a sophisticated test that measures the tear thickness and in turn provides information about the lipid or oily layer on the surface of the eye. This can reflect the severity of meibomian gland dysfunction and can also be used to measure progress. We at Centre for Sight having used the device for 2 years do not believe that the test is senstive or specific enough and other tests are more informative. Laser eye surgery, especially traditional Lasik can aggravate dry eye. Although Centre for Sight uses the IntraLASE laser for Lasik, which reduces the duration and severity of dry eye, patients with dry eye are first treated for their specific cause. Once corrected they can undergo laser vision correction. If they cannot be corrected, Laser eye surgery will not be recommended and other options may be considered. Centre for Sight doctors are all fellowship trained in Cornea and the Anterior Segment. In the course of their usual practice, they are often asked to see patients for second opinions and to manage dry eye. You can be confident that you will be evaluated by doctors with expertise in this area at the time of your consultation.